George Hayward was the eighth child of William and Ann, born in Great Missenden, Bucks on 8 July 1787. His father was ambitious for his sons and by this time was well connected. William secured sponsorship for his son to enter the Madras Native Infantry from George Thelluson, a wealthy Merchant Banker and Director of the East India Company. 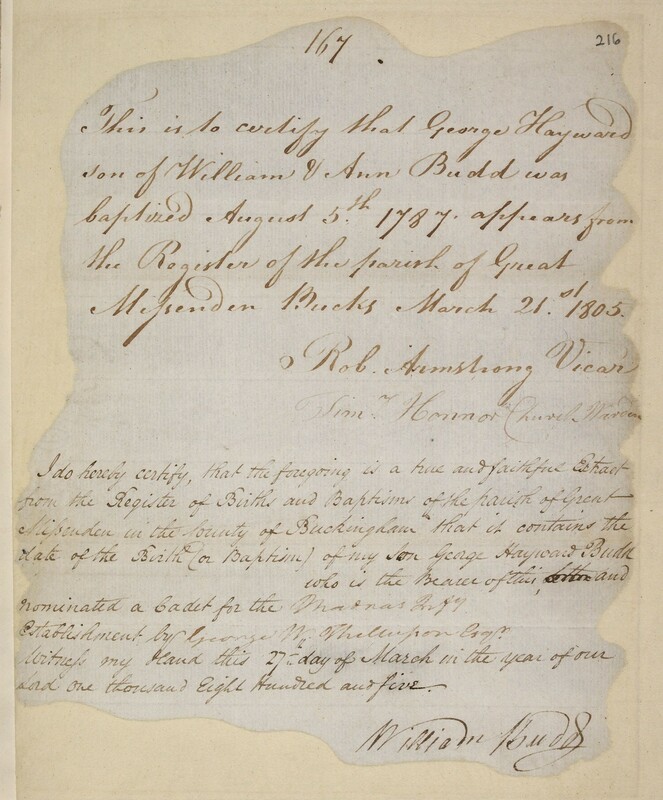 George’s attestation papers were signed by his father in March 1805 and the 17 year old cadet sailed for India in early April. The voyage on the Admiral Gardner (which as to sink on the Goodwin Sands carrying a year’s worth of coinage and be salvaged in the mid 1980s) took some 7 months. It was also not without incident as the captain’s log of 27 November 1805 relates: “...at 9am saw a strange sail bearing N steering down to us Clear’d the ship for action...she being within pistol shot hoisted French colours & fired a shot which we immediately returned with a broadside and continued engaging until 15 minutes past 11am when she bore up and made sail to the SSW.” Ten men were ‘severely’ or ‘dangerously’ wounded by shot or burns. The Ship made repairs at sea for several days after this action. No doubt with some relief, the crew and passengers anchored at Madras Roads in 14 December 1805 and GH Budd joined the 2nd Battalion, 22nd Madras Native Infantry. Life in the East India Company’s Militia (comprised of English Officers and native soldiers) was often gruelling, with many months spent in ‘Camp’ out in the field away from Barracks, protecting the Company’s assets and interests. Time in barracks, or ‘Forts’ as they were known was no doubt precious. It was here that colonial life took hold. Lieutenant Budd married Eliza Cole, daughter of a Worcester Surgeon (Pennell Cole) whose family already had Indian connections (including Eliza’s aunt who had also married there). They married in Cannanore (now known as Kannur in the State of Kerela) on 27 February 1810. 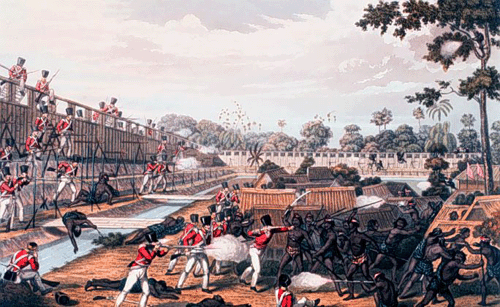 Not much is known about George’s career or time in India, but the following took place: In 1813 GH Budd was acting Fort Adjutant at Cannanore, and by 1815 he was in place in that role. By 1818, perhaps tiring of the difficult conditions in India, Eliza boarded the East Indiaman Camarthen which landed in England in June 1818. Tragically her sone Charles had died only 3 months earlier while still on passage, highlighting just how gruelling such passages were. Eliza was never to return to India. By 1820, the newly promoted Captain Budd has qualified for a 3 year furlough back in England - he was no doubt desperate to be back with his family. On 8 April 1822, shortly before returning back to India, George is to be found at 25 Clapham Road Place in Clapham, London (at that time a village unconnected to London) and made his will that day. It is not known if he was present at the birth of his daughter Eliza in June of that year, but records show him back in India by June 1823. He fought in the first Burmese War in Northern India and was promoted Major on 03 October 1826. Only 7 weeks later on 20 November 1826, his death is reported a Wallajabad East India in the State of Tamil Nadu. He fell to the scourge of Indian colonialists - colera. Eliza, his wife survived him by only 3 years and is buried in Worcester, where her parents and brothers were then living.